STL containers are designed around the concept that each container controls its own collection of elements, giving access to them in a manner specified by the container's type: so, an std::set maintains the elements ordered by a specified sorting criterion, std::list allows for free positioning of elements along a linear sequence, and so on. Sometimes, the necessity arises of having different access interfaces to the same underlying collection: for instance, some data might need to be sorted according to more than one comparison predicate, or a bidirectional list might benefit from a supplemental logarithmic lookup interface. In these situations, programmers typically resort to manual compositions of different containers, a solution that generally involves a fair amount of code devoted to preserve the synchronization of the different parts of the composition. Boost.MultiIndex allows for the specification of multi_index_containers comprised of one or more indices with different interfaces to the same collection of elements. The resulting constructs are conceptually cleaner than manual compositions, and often perform much better. An important design decision has been taken that the indices of a given multi_index_container instantiation be specified at compile time: this gives ample room for static type checking and code optimization. Boost.MultiIndex takes inspiration from basic concepts of indexing arising in the theory of relational databases, though it is not intended to provide a full-fledged relational database framework. 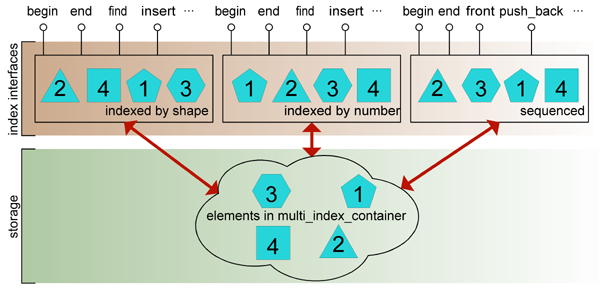 multi_index_container integrates seamlessly into the STL container/algorithm design, and features some extra capabilities regarding lookup operations and element updating which are useful extensions even for single-indexed containers. Fig. 1: Diagram of a multi_index_container with three indices. The figure above depicts a multi_index_container composed of three indices: the first two present a set-like interface to the elements sorted by shape and id, respectively, while the latter index provides the functionality of a bidirectional list in the spirit of std::list. These indices act as "views" to the internal collection of elements, but they do not only provide read access to the set: insertion/deletion methods are also implemented much as those of std::sets or std::lists. Insertion of an element through one given index will only succeed if the uniqueness constraints of all indices are met.